Recursive Adaptation's image is a duplicate of Pokémon Trading Card Game. It is also entirely dependent on the caption if you aren't familiar with Pokemon. Seems like we'll need a series of images to show the layers of adaptation occurring. I agree that it may take a chained collage to get this one across. I previously made a thread where I suggested alternate images for the TCG, but it was locked for inactivity. I felt like there had been a thread recently, but didn't see anything in the page's source code about it. ^ We had one for Recursive Canon that stalled. I don't remember a thread for Recursive Canon. Could you link to it? Can't find. Either I am mistaken or it was discussed somewhere else on this wiki. How's this thing I threw together? Could work, but could you reupload it with a transparent background? It could also be autocropped right up to the edges. Agreed. A cleaner version would be a from me. 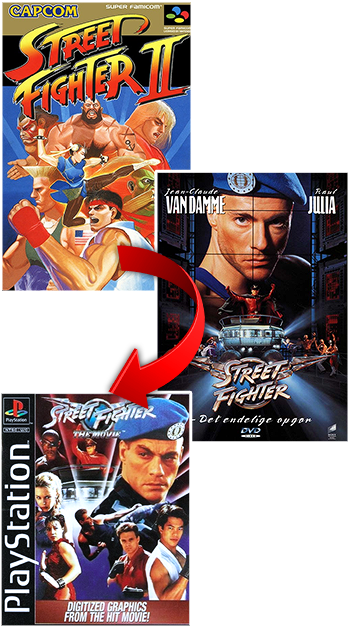 From Street Fighter to Street Fighter: The Movie to Street Fighter: The Movie: The Game. Would a duplicate image be a problem here? EDIT: Whoops, missed a spot. 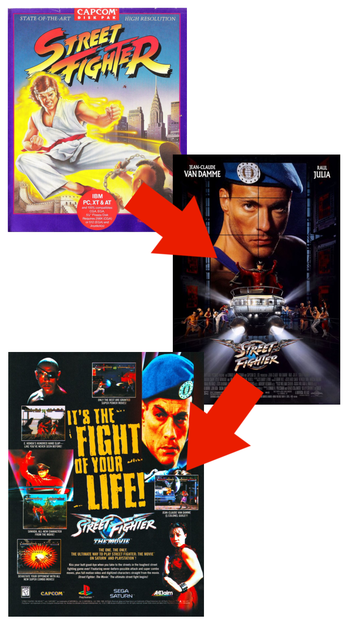 I'm not too worried about one of the posters being a duplicate. 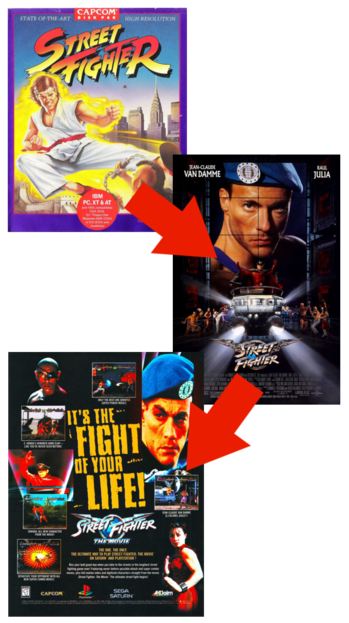 Plus finding an alternate poster for one of the works pages probably isn't that hard. 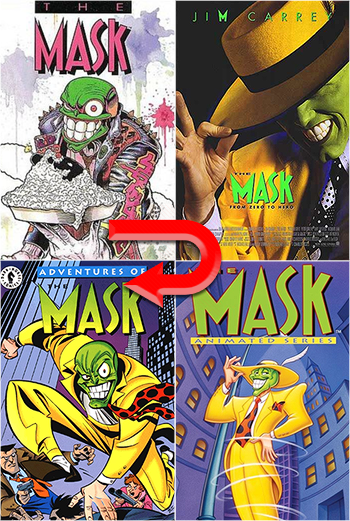 I had another example worked out but in this case it's not apparent which source was used for the adapted comic book. Edit: Don't know if it's intentional that the three parts are all from different languages (Japanese, Norwegian, English), but that actually makes me like it more for some reason. Everybody's got something to hide except me and my Grookey. I'd be happy with 13 or 15. 13>15 for including less covers. Join the new Big Bad subpage cleanup! I prefer 13 since it makes it clearer the first and third are both games.